Panasonic HDC-SDT750 is first consumer camcorder, which can record 3D and 2D videos in AVCHD format. However, there is only Windows version of bundled software in CD for easy editing. If you face error message when trying to import Panasonic SD750 high quality videos in iMovie 8/9, you may need a third party application to convert AVCHD MTS/M2TS to apple built-in codec for iMovie. Apple Intermediate codec is one of the apple built-in codecs, while others could be Apple DV/DVCPRO - NTSC, DVCPRO50 - NTSC. Aunsoft MTS/M2TS Converter for Mac is the recommended camcorder software to convert AVCHD to apple compatible formats. Final Cut Express, Final Cut Pro are also compatible with AIC for editing. If you want to edit avchd high quality video with Apple Intermediate Codec in iMovie, FCE, FCP, just follow the step-by-step guide below. Step 1. Download SDT750 2D videos to Aunsoft MTS/M2TS Converter for Mac. Connect Panasonic HDC-SDT750 to iMac via USB 2.0 cable, you can copy and transfer the .mts files from camcorder to Apple hard drive. Alternatively, you can run Aunsoft MTS/M2TS Converter for Mac as the best AVCHD to AIC converter on Mac OS X, click the "Add" button to download .mts files from camcorder to the application. Step 2. 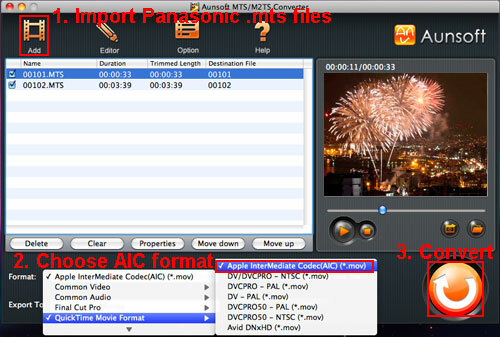 Choose AIC codec for Mac. Click the "Format" option, and navigate to QuickTime Movie Format > Apple InterMediate Codec(AIC) (*.mov) as output format. To get 1920x1080 video, click the "Settings" button to choose 1920*1080 as output video size. Step 3. 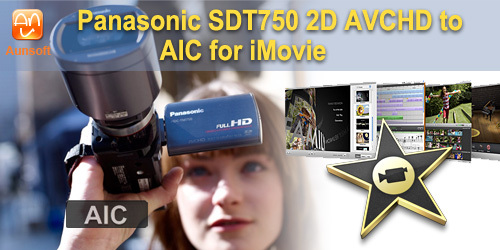 Convert Panasonic SDT750 MTS to MOV with AIC for iMovie. Click the convert button to start converting 2D AVCHD videos from Panasonic SDT750 MTS to MOV Apple Intermediate codec for iMovie/FCE. When the conversion is finished, you can edit high quality videos from Panasonic HDC-SDT750 in iMovie, Final Cut Pro, Final Cut Express on Mac. 1. The Mac AVCHD to AIC converter also works with 1080/60p videos from Panasonic HDC-TM700/SD700/HS700, 1080i mts/m2ts videos from Sony HDR-CX550, Canon HF S21, etc. 2. Enjoy 10% off discount if you purchase Aunsoft MTS/M2TS Converter before Jan 17, 2011 as New Year promotion.